A viewer for Personal Knowbase files. Have you ever wanted to share your Personal Knowbase data files with friends or co-workers, even though they don't have a copy of Personal Knowbase? Now you can. Personal Knowbase Reader gives your associates read-only access to data files created using Personal Knowbase. With PK Reader, they can view, search, export, and print Knowbase articles, but cannot modify articles or create new ones. 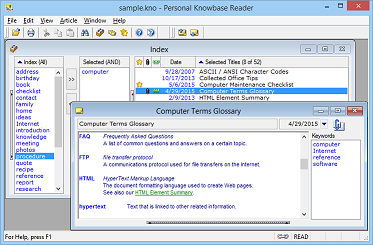 Personal Knowbase Reader is free for personal use. Feel free to download a copy for your friends so you can share your Personal Knowbase files. Run PKRSETUP.EXE to install Personal Knowbase Reader. PK Reader is the perfect tool for distributing your Personal Knowbase content to associates. Create a Knowbase file of product information to distribute to all employees. Create a Knowbase file of research information or class notes to distribute to students. Create a file of topical information to distribute to members. Create a Knowbase file of support information for help desk employees. Create FAQs or clippings files to distribute to regular visitors. Reads files created by Personal Knowbase versions 2, 3, or 4. Quickly access related information using keywords. View thumbnails of image attachments with article text. Export information to text, Cardfile, HTML, RTF, and CSV files. Install on a portable drive, such as a USB drive, to carry your notes with you. Install on a CD for duplication and distribution of content. Create reports about articles and keywords. Print articles or lists of articles. Personal Knowbase Reader can also read files across a network. You can place a Knowbase file on a computer as a publicly readable file, and other users can use PK Reader to open and view the file simultaneously on any other computers which can access the file. A license is required for business, government, or educational use of PK Reader. For information about licensing, see our PK Reader Licensing page. Personal Knowbase Reader is free for personal use. For business, government, or educational use, a license is required. Click here for information on licensing Personal Knowbase Reader. Get more information about Personal Knowbase itself.